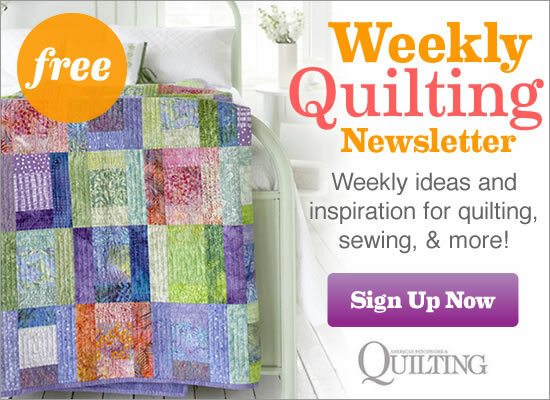 We know you love the projects that appear in American Patchwork & Quilting® magazine. We took inspiration from projects in the magazine and created Web-exclusive versions, complete with full instructions. Fussy-cut a beautiful fabric to star in the center of gemlike quilt blocks. Choose a holiday print with metallic touches for a throw that really shines. Designers Chloe Anderson and Colleen Reale loved Holiday Sparkle’s fabric mix of florals, paisleys, and mosaics so much that they used the same fabric line in another colorway to make a second version of the quilt. Make a sweet flannel quilt suitable for your favorite little one—boy or girl. The simple appliqué is an updated take on old-fashioned pull toys. Use three colors to draw attention to Pinwheel units. This wall hanging utilized romantic floral and toiles from the Always and Forever collection by Alex Anderson for P&B Textiles. Download instructions needed to make this wall hanging. A needle-turn-appliqué bird sits among ripe pairs in this small, primitive wall hanging. Funky buttons, hand-embroidered stems, and a background with just a bit of piecing give the finished quilt movement. Make a springtime scene using the Hopscotch and Tokyo Basics collections from Red Rooster Fabrics. Create a wall hanging in no time using fusible appliqué to assemble the bird, tree, and pear motifs and fussy-cutting the flower pieces. Grab a cup of your favorite beverage, a book or magazine, and this warm-tone throw to settle in for an afternoon of reading. Star blocks alternate with hourglass blocks to compose a stunning, scrappy quilt. Sew a bright wall hanging using lime green, pink, orange, purple, and brown prints from the whimsical Fandango collection for Henry Glass & Co. With careful fabric selection, you can highlight the quilt’s star or hourglass blocks. Fabric placement in the hourglass blocks also creates a secondary star design. Get this free quilt pattern here. Use house and tree blocks to create a homey wall hanging. Choose stripe fabrics for some of the architectural elements to make it appear as if there are bricks in the chimney and siding on the house. Fabrics are from the Millie’s Garden collection by Joined at the Hip for Clothworks. Solids and prints play off each other in this reproduction-fabrics throw, which showcases a new interpretation of the Chrysanthemum block. Buy this quilt pattern here. Frame a single beautiful block in fabric. A mitered a middle border enhances the effect. Use Jinny Beyer’s Hermitage collection for RJR Fabrics to achieve the serene, evening-garden palette. While it looks like traditional needle-turn appliqué, this seasonal quilt is all sewn by machine. You should be able to get it done in time for gift-giving! Quiltmaker Laura Boehnke utilized fusible appliqué and a small zigzag stitch to easily assemble an appliqué wall hanging. Two in the Bush Flannel and Woolies Flannel by Bonnie Sullivan for Maywood Studio add texture to the quilt. Download instructions needed to make this tabletop quilt. Neutral batiks in shades from light cream to deep purple-black form an intriguing, barely there diamond pattern over the entire quilt top. The pieced blocks are as easy as making triangle-squares. High-contrast fabrics from the Kiwi collection by Alice Kennedy for Timeless Treasures Fabrics combine to make a sassy wall hanging. A mellow print complements each bright color and busy print. Don’t let the sight of all these small pieces scare you. They’re actually cut big enough to handle easily, then trimmed to size after they’re sewn in place. Get this free pattern here. Designer RaNae Merrill made a second stocking out of fabric from the Snow Show collection by Susan Winget for Benartex. For more information of what else you can do with foundation-pieced spirals, check out RaNae’s book, Simply Amazing Spiral Quilts (Krause, 2008).